Our organization is reckoned as one of the prime Manufacturers and Suppliers of Storage Racks. 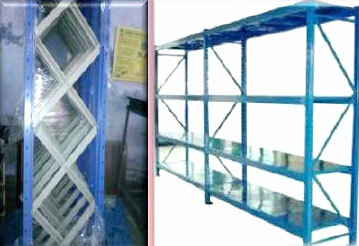 These Storage Racks find application in different industrial storage systems. The Storage Racks, offered by us, are designed and manufactured strictly adhering to the set international quality standards. Our highly durable Storage Racks provide maximum utilization of space and eliminates misplaced inventory. We are leading manufacturer of industrial storage systems & pioneering new ideas for efficient storage and materials handling. Our shelving products are designed and manufactured to international quality standards which will give you a storage system that maximizes your space utilization, eliminates misplaced inventory and stock outs and is capable of meeting your needs today and tomorrow.